Ushuaia is the southernmost city in the world. It is also the gateway to some of the best trekking and wildlife experiences in Tierra del Fuego, and the jumping off point to voyage down to Antarctica. Hotels here range from extravagant and luxurious high up in the mountains, to cosy and authentic right in the centre. 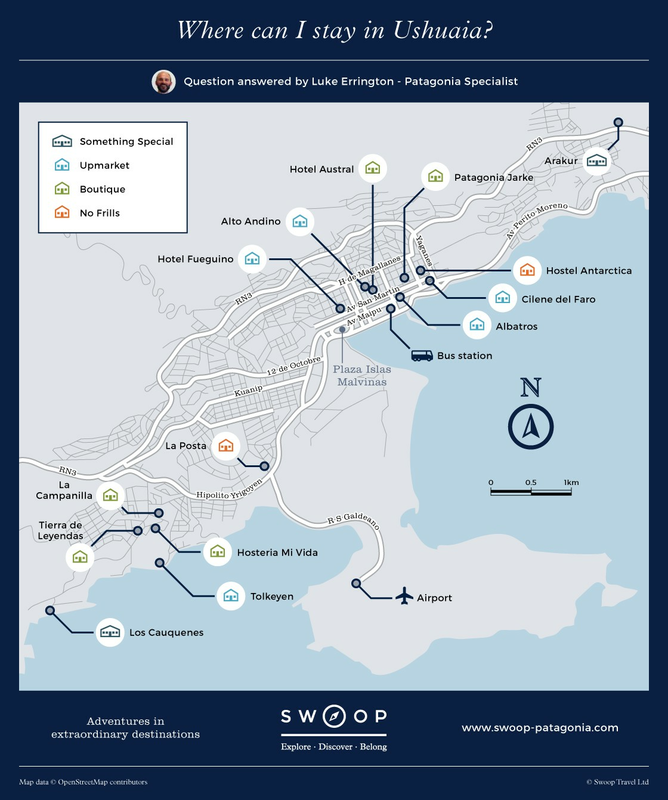 Where can I stay in Ushuaia? Just a short taxi ride out of town lie the hotels with the best views in Ushuaia. Wake up to the sun on the Beagle Channel, and watch the boats float by below. Los Cauquanes is one of only a handful of places that sits on the shore of the Beagle Channel and is certainly the most luxurious. From your room you can gaze across one of the most beautiful and dramatic stretches of water in Patagonia, enjoying the unique birdlife that frequent these shores and distant mountains of Isla Navarino. The hotel is traditional yet comfortable and spacious, and there’s a spa for resting your legs after a day exploring the national park. Just 6km west of Ushuaia, nip into town with an easy 15 minute journey by shuttle bus or taxi. The Arakur sits in the mountains above Ushuaia and offers extraordinary views over the Beagle Channel. They have a private nature reserve which offers at least half a day of wonderful hiking and exploration either with or without a guide. You’ll be 20 minutes from town by shuttle bus or taxi. If you want to get a feel for the wilderness of Tierra del Fuego rather than the urban life of Ushuaia, and have the budget, then this is the best option. A first choice for birdwatchers, the Tolkeyen sits on the shores of the Beagle Channel, and the surroundings attract an extremely diverse range of birds, especially at low tide. There are 52 rooms, including a couple of suites. They are dated but comfortable, and the hotel restaurant is well-priced. A 3 star option 10 minutes outside of town, just a couple of hundred metres from the Beagle Channel. You’re slightly up the hill so some rooms have a view out across the water. The hotel has an authentic feel, somewhat like most Patagonian estancias. They describe themselves as a Boutique hotel and customer feedback has been very positive. Our number one choice of the mid-range options on the basis of: small and homely ambiance, short walk to the Beagle Channel, and outstanding food. There are only 16 rooms and whilst they aren’t especially large the architecture makes for a light and airy feel and the place is full of interesting antiques. The owner of the hotel is also a chef so you’ll be sure to enjoy good quality local cuisine. The hotel is only 10 minutes from the centre of town by taxi. A small, friendly, owner-run hotel on the outskirts of Ushuaia. The rooms are cosy but comfortable and breakfast will stand you in good stead for a day ahead exploring the Tierra del Fuego national park. A taxi ride to San Martin in the middle of town costs around US$7 and takes about 10 minutes. A great choice at this price point if you don't mind being outside of town. This is an upmarket hostel with both shared dormitories and some private rooms. The atmosphere is very welcoming and friendly. It's very close to the airport (almost walking distance) but a good 15 minutes from town. When I visit Ushuaia I always like to stay out of town - if I'm travelling all the way to the end of the world then it seems a waste to miss out on those incredible views of the Beagle Channel. Made up of 48 spacious and modern apartments, this option is perfect for those who want a bit more space. The apartments are self-catered, giving you the freedom to cook when and what you want. Guests also have access to the spa and swimming pool. Hotel Fueguino has a great location, just one block from the main street. The hotel was built 10 years ago but still feels pretty modern and in good shape. The downside of something at this price is the views: none of the rooms have an unobstructed view to either the channel or the mountains. The original 4 star hotel, and part of a Argentinian hotel group, the Albatros has the most central location in town - directly in front of the port. The hotel has a spa and lots of well decorated public areas. This is a modern hotel just two blocks from San Martin, the main street in Ushuaia. The breakfast room is up on the top floor and has clear views out across the water; as do some of the bedrooms on the higher floors. There are also a couple of apartments if you prefer the independence of cooking for yourself from time to time. Staff are very friendly and the hotel is light, airy and spacious. With just 15 rooms, this small guesthouse has a friendly welcoming feel. Situated four blocks up the hill from the Beagle Channel, it's a 15 minute walk to the port and the views are some of the best from the in-town hotels. Nice decor and plenty of public areas make this a great choice at this price point. This is the safe bet for a value-for-money stay in Ushuaia without any surprises. The hotel is quiet, Wi-Fi available throughout, and the rooms clean and comfortable. It's also conveniently located right in the city centre, so it's easy to find and is only a short walk from the restaurants. One for those wanting to connect with other travellers. The fantastic common room creates that typical backpacker-vibe that engenders friendliness and befriending of fellow guests. Cheap, clean, comfortable, and in the city centre. Is it easy to reach the centre from an out of town hotel? Most hotels are just 10-15 minutes from the centre. The upmarket hotels offer a shuttle service, and a taxi will only cost around $10 USD. How far is the port from the central hotels? If you have a hotel near the main street, San Martin, then you'll easily be able to walk to the port in just 5 minutes. Why are the hotels so expensive? Ushuaia is the disembarkation point for the majority of cruises to Antarctica. This means that it has a very seasonal demand in November through to February and the hotels often struggle to fill their rooms during the rest of the year, pushing up prices. Where is the national park in relation to all the hotels? The Tierra del Fuego National Park is 11km west of town and can be reached either by bus or taxi. Ushuaia Hotels: How can we help you? We can help you plan and arrange a multi-day activity trip, such as a hiking, kayaking or horse-riding trip, to fit in with the rest of your plans. We’ll help you arrange the logistics of the trip too, such as how you’ll get to and from the trip departure point and where you’ll stay before and afterwards. Ask about arranging a multi-day activity trip. With 15 years' experience in Patagonia, we’re experts at creating bespoke itineraries. We'll work with you to design a 2-3 week - or longer - holiday based on your exact requirements, from hiking trips to flights, bus trips, transfers and, of course, your accommodation. Find out more about Tailor-made trips.